HEY KIDS, DO YOU LIKE TOURNAMENT THREADS? Because I sure do! Welcome to the SUPER TOURNAMENT THREAD FIGHTERS' TURBO EDITION. 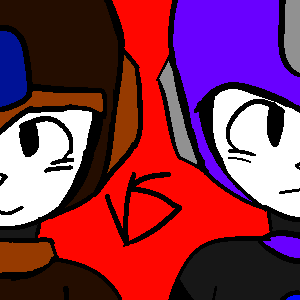 This... IS A TOURNAMENT THREAD, where your Mega Man Character(or a canon robot master) gets to fight! The tournament will be held in the #roleplay channel on the MMRPG Prototype Discord! I, the MegaBoy will be the judge of the tournament. And decide who will be the victor. There will be EIGHT contestants fighting it out in Two Round One on One matches. After seven contestants are beaten and one stands, they will have to fight FOUR new contestants. The final one resulting in you being crowned the winner of the tournament. No Overpowered Characters allowed, that means any purple pokemon themed phenomenon with an obsession with nine balls is blocked out. If you miss a scheduled fight three times in a row, the character involved in the current fight is eliminated out of the tournament. Bio: The first of a set of Robot Masters created by Light to balance between Light-bots and Wily-bots known as the All-Star Numbers. Originally created to help out Mega Man in his adventures, Beta Man eventually went out on his own to do his own adventures. He used to have been partnered up with Tone, but Tone recently retired/left/died, so Beta is no longer partnered up. But he has recently proven that he doesn't need a partner to do sh*t, so there's that. Ninja Katana- A prototype of the Z-Sword that is designed like a katana. Has laser and cutter capabilities. Ninja Accelerate- A reversed-ish Time Slow that speeds the user up in time. Quick Boomerang Ninja Vanish- Makes the user blend into the shadows to avoid damage temporarily. Ninja Star- A throwing star with laser properties to make it more Swift/Laser rather than Swift/Cutter. Arachnid's Web- A weapon obtained from one of Yveltal's robots in his world, it does little damage, but slows down opponents temporarily upon being hit. Marine Ray- A weapon obtained from one of Yveltal's robots. A slow-moving laser attack. Swift Dash- A weapon obtained from one of Yveltal's robots. A dash attack at high speeds. Bio: A robot created by Dr. Light in response to the ASNs, Ninja Man was created to counter Beta Man. Other Hidden Wily Numbers were made to counter the other ASNs, but through unknown means they disappeared, with no means of recovering the data. Ninja Man is Beta's rival and would challenge him constantly, and even joined the tournament in hopes of facing him. Bio: Originally known under the alias of Phantom Man, Ceres, along with his cohorts, were augmented with alien technology acquired by Dr. Wily after the Evil Energy incident. Due to this, on top of his myriad of illusion-based skills, new abilities were gained, making him more adept to the Space Core. After hearing that a new tournament was starting up... ...he begun to laugh like a maniac at the thought of a new tournament beginning, when they get so quickly canceled on account of being "too dangerous". ...but, knowing that he had the chance of obtaining useful copy data for his systems, he opted to enter anyways. -alone, this time, as to not complicate matters. Luster Void - Pockets non-Laser projectiles. Can be reflected back to the foe. Gamma Blast - Blasts the foe with a stream of radiation. Comet Strike - Fires a dusty ball of ice at breakneck speed. The dust can blind the foe if fired close range, but that causes recoil. Corona Crash - Crashes into the foe surrounded in flames. The recoil damages the user. Starlight Riptide - Batters and disorients the foe with a luminous whirlpool. Diamond Cluster - A storm of fine diamond particles that pierces armor and damages circuitry. Cross Draw - Slices the foe with a blade and drains some of their energy back to the user. False Split - Spawns a diminutive clone to latch on and hinder the foe. Bio: An enigmatic space bot. Last spotted at the Tournament of Champions under a different identity, he has now replaced his Freeze core for a rudimentary Copy core, and armoured up substantially since his last appearance. He joined this tournament for the thrill of battle and oilshed. EDIT: Changed name. Bio may be edited soon. Despite not having a copy chip, he has 2 preloaded RM weapons. Bio: A random robotic citizen of Mega City abducted by Wily to be weaponized. But what do ya know, the great Dr.Wahwee made a booboo and forgot to swap out the I.C.chips before rebooting him, so he escaped. TH-15: Delet this. Deals a lot of damage but with substantial spread and recoil, delets objects on the battlefield. MP-412 REX: A Basic revolver, dealing okay damage, with minor recoil, can't be used in succession. PP-2000: A SMG, shoots fast, but runs out quickly, extremely minor damage. Mosin-Nagant: A Rifle without a scope, dealing substantial damage, reload speed is slow with substantial recoil. AK-47: Another gun in his arsenal, shoots fast, deals medium damage, little recoil, runs out quickly. Russian Hail: Summons the hail and cold weather onto the battlefield, causing it to become slippery and hazardous. Bio: A Remake of Ice Man, made by Doctor Cossack to protect his motherland. Easily enraged by filthy CAPITALIST AND AMERICAN SCUM. He joined the tournament to induce communism all upon Megacity. Bio: In the Alola region, a lone researcher named Dr. Nerdia was studying a Ultra Wormhole when suddenly 8 deactivated robots came out of it. Later, when Necrozma attacked, she activated them and made them into the Necrozma Battle Force! Shock Man has the ability to control static electricity around him, and he may not be very quick, but he packs quite the punch! Alright! Submissions closed, I'll make the bracket soon.